Unlike the US and EU, Russia does not seek to remake the world in its image. That doesn’t stop the EU from blaming Russia for its own problems. The accusation seems to be that Russia is capitalizing on domestic opposition to Merkel’s open-door immigration policies by directing funds to the contrarian Alternativ für Deutschland (AfD) party, whose support has surged as disenchantment with Merkel has grown (as seen in its success in recent state elections). But if evidence of such money flows exists, why not simply confront the leadership of AfD with it? This is what happened when it emerged that France’s Front National had received a 9.4 million-euro-loan from a Russian bank in 2014. But Sārts’s “revelation” wasn’t meant to inform the public; it was meant to scare it. It’s best seen as the latest act in a joint NATO-EU “information war” against Russia. Talk of “weaponization” and “regime change” increasingly bears the hallmarks of a strategy intended to shift responsibility for Europe’s “refugee crisis” from the shoulders of an EU leadership that has proved unable to stop the flow of migrants, to Russian President Vladimir Putin’s. Eerily, Sārts and Breedlove are merely repeating claims that European Council President Donald Tusk (prime minister of Poland from 2007 to 2014) has been putting about for almost six months. Like most EU leaders, Tusk is silent on the deeper causes driving this sea of humanity: state failure in Afghanistan and Iraq after more than a decade of misguided Western wars and abortive “nation-building,” and, in Syria’s case, ISIS’s dramatic advances last spring against previously government-held areas, even as Western governments and their Turkish, Saudi, and Qatari allies funneled arms, money, and diplomatic support to antigovernment rebels in other parts of the country—a confused and irresponsible strategy that has only advanced ISIS’ cause. When Russia’s Syria air campaign began on September 30, migrant arrivals had long since overwhelmed frontline states like Greece. Indeed, Russia’s military support for government forces in Syria may turn out in the long run to have played a crucial role in stemming refugee flows to Europe. Heading off the possibility of Damascus’ fall to ISIS last autumn, Russia laid the groundwork for the recent cease-fire agreements that hopefully foreshadow the conflict’s long-overdue political resolution. This has now allowed Moscow to announce the withdrawal of the bulk of its forces. Rightly or wrongly, the “migrant crisis” has become emblematic of the European Union’s inability to guarantee the safety and security of its citizens. Even after its recent agreement with Turkey, the flow of refugees seems likely to continue. The same is true of events in Ukraine. Brussels’ determination to draw that country into an Association Agreement ultimately led to armed revolution in the capital and civil war in the provinces. But the EU has never acknowledged any share of responsibility for the tragedy. Ukraine’s “European choice,” which has so far cost some 5,000 lives and billions of dollars of damage in the Donbass and precipitated a dramatic plunge in living standards across the country, is Moscow’s sinister fault alone. In fact, the push behind the EU’s wooing of Ukraine and other former Soviet republics came from Poland, brain child of former Foreign Minister Radek Sikorski and Prime Minister Donald Tusk. Euphemistically named the “Eastern Partnership” [EaP], its purpose, as a 2008 US cable approvingly acknowledged, was to “counter Russia’s influence in Eastern Europe.” Though Russia would be “officially welcome to take part in the Partnership,” the EaP would, in practice, be directed against it. That gamble has since spectacularly awry. Are Tusk’s friends in NATO now covering him and the national leaders who supported his elevation to the EU’s top job? These would include Germany’s Angela Merkel and Britain’s David Cameron, whose rhetoric on Russia has often been as tough as Tusk’s. Today, Moscow has been accused of both deliberately bombing residential areas of Aleppo to force inhabitants to flee to Turkey and thence to Europe with the aim of breaking EU unity and providing unspecified support for Europe’s far-right or contrarian parties, with Moscow’s overriding aim being to stoke euro-skeptic views to paralyze the EU, if not break it up. This would seem to misread the conservative mood of Russia’s leadership and foreign policy realism. Unlike the United States and EU, Russia does not seek to remake the world in its image. At the United Nations last September, President Putin condemned open-ended Western military campaigns in Afghanistan, Iraq, Libya, and Syria, often justified in the name of “democracy promotion.” These had resulted, he said, in a “flow of people forced to leave their native land” that “has literally engulfed…Europe. It is essentially, a new, tragic Migration Period.” He did not see this as something to be celebrated. On realist grounds, Russia opposes EU policies in Eastern Europe that attempt to exclude it from a region with unparalleled historical, cultural, religious, economic and strategic significance to it. It would love EU sanctions lifted. But it doesn’t follow that Putin seeks the subversion, let alone the “destruction,” of the EU as a trade zone or a peace project (something in any case beyond Moscow’s power). If EU unity breaks over refugees, the euro, Ukraine, or sanctions, it will be on the rocks of that organization’s own contradictions and members’ conflicting interests, which it’s often lazily forgotten they still have. In an ideal world, EU leaders like Tusk would take responsibility for the destabilizing consequences of the EU’s array of increasingly ambitious projects, including the EaP. Instead, through the reinflation of anachronistic Cold War tropes, they attribute to Russia a revolutionary foreign policy, though there is very little evidence of this. Can it be realistically believed that Moscow is “weaponizing” refugee flows or seeking to “topple” Merkel’s government? 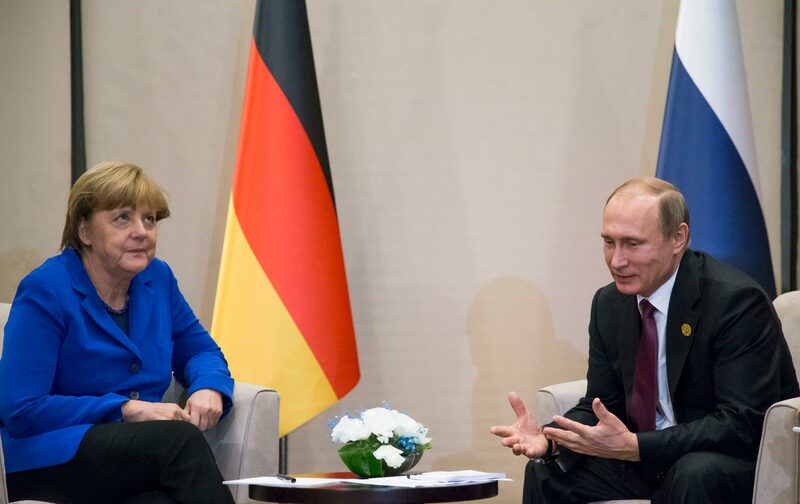 Merkel has, after all, proved in practice willing to support the Minsk agreements. On the other hand, if the Kremlin is funding parties opposed to Merkel, then this would represent Russia’s (rather late) conversion to practices Western governments have long employed in support of Russia’s so-called opposition. What’s good for the NATO-EU goose is surely good for the Russian gander. Hostility toward both national governments and the supranational EU bureaucracy is rising in many European countries. But it does so independently of Russia, which has (once again) been made the scapegoat for Europe’s failings. These include a widespread sense of blockage in national political life (that change, no matter who is in government, is no longer really possible) and the crushing absence of realism in the EU’s conception and practice of international politics. How was it that the foreign relations of the EU’s 28 sovereign members, and the peace of Europe, were allowed to become hostage to the geopolitical ambitions of Poland? Thoughtful Europeans, on left and right, have concluded that revitalization of democratic politics in Europe demands not “ever closer union” (and the further transferal of powers from national parliaments to the Brussels bureaucracy) but the reanimation of those nation-states with a primary claim upon citizens’ loyalties and civic engagement. Russia’s complaints intersect with these sentiments but are grossly misrepresented as their cause. In early March, Russian Foreign Minister Sergei Lavrov stated: “History doesn’t confirm the widespread belief that Russia has always camped in Europe’s backyard and has been Europe’s political outsider.” He’s right. For centuries an essential part of the European balance and dazzling center of European high culture, Russia cannot be excluded from Europe forever. In an important sense, the “new Cold War” is a “clash of Europes,” a struggle not to destroy Europe, but define it. How in recent years the EU, once the world’s most ambitious peace project, became, from the pauperization of Greece to the confrontation of nuclear powers over Ukraine, a force for sweeping economic and geopolitical destabilization is a story best told elsewhere. For the moment, like their counterparts in Washington, many European leaders seem to lack any vision for the EU’s relationship with Russia other than as a convenient scapegoat for its own ills. Matthew Dal SantoMatthew Dal Santo is a Research Fellow at the Saxo Institute, University of Copenhagen, Denmark, where he works on contemporary Russia.